侯恩科, 张杰, 谢晓深, 徐友宁. 无人机遥感与卫星遥感在采煤地表裂缝识别中的对比[J]. 地质通报, 2019, 38(2-3): 443-448. Hou E K, Zhang J, Xie X S, Xu Y N. Contrast application of unmanned aerial vehicle remote sensing and satellite remote sensing technology relating to ground surface cracks recognition in coal mining area[J]. 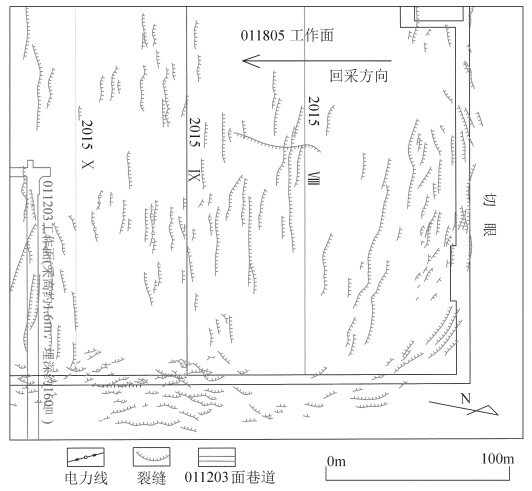 Geological Bulletin of China, 2019, 38(2-3): 443-448. Abstract: The surface cracks induced by coal mining constitute one of the most intuitive manifestations of ground collapse and also the main factor causing the environmental deterioration in the coal mine. 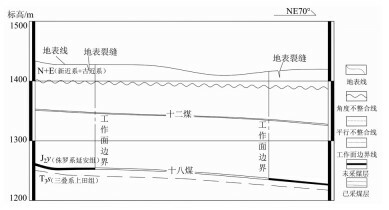 Thus accurately grasping the distribution law of surface cracks is the basis for the treatment of ground subsidence in the coal mine. 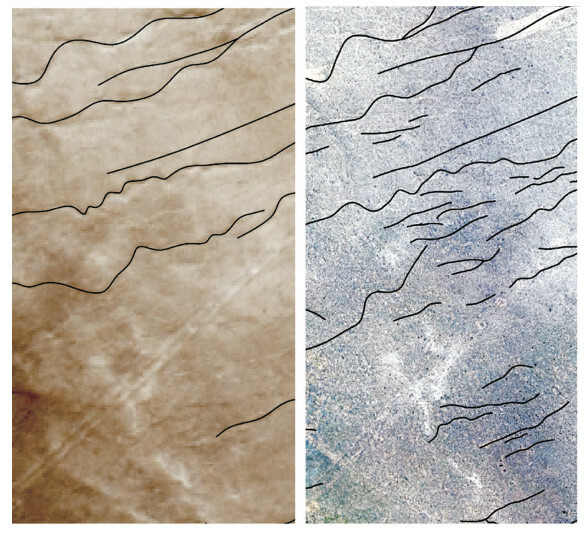 In this paper, satellite remote sensing and unmanned aerial vehicle remote sensing technology were used to investigate the distribution of surface cracks of the 011805 working face which was selected as the research area. 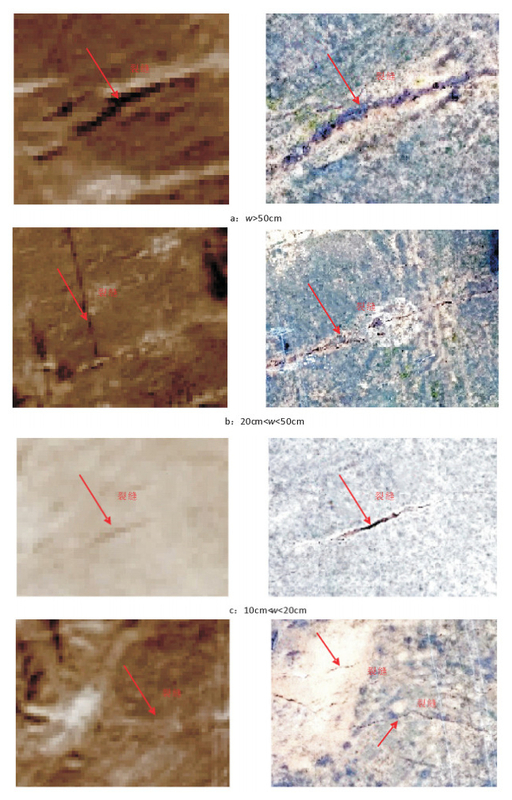 Research shows that in the aerial images of UAVs, the overall vision of ground cracks is clear, which can fully reflect the development characteristics including the shape, length, and location of ground cracks with a width greater than 5cm. and the interpretation results of the ground cracks are closest to reality. UAV remote sensing not only improves the accuracy and reliability of the surface crack investigation in the coal mining area but also provides abundant basic data for the study of the surface cracks. 胡振琪, 王新静, 贺安民. 风积沙区采煤沉陷地裂缝分布特征及发生发育规律[J]. 煤炭学报, 2014, 39(1): 11-18. 胡青峰, 崔希民, 袁德宝, 等. 厚煤层开采地表裂缝形成机理与危害性分析[J]. 采矿与安全工程学报, 2012, 29(6): 864-869. 王瑞国. 基于WorldView-2数据的乌东煤矿地质灾害遥感调查及成因分析[J]. 国土资源遥感, 2016, 28(2): 132-138. 张启元. 无人机航测技术在青藏高原地质灾害调查中的应用[J]. 青海大学学报, 2015(2): 67-72. 谢晓深, 侯恩科, 高冠杰, 等. 宁夏羊场湾煤矿浅埋煤层开采地面塌陷发育规律及形成机理[J]. 地质通报, 2018, 37(12): 2233-2240. 邓喀中, 王刘宇, 范洪冬. 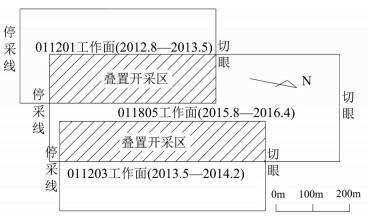 基于InSAR技术的老采空区地表沉降监测与分析[J]. 采矿与安全工程学报, 2015, 32(6): 918-922. 张舒, 吴侃, 王响雷, 等. 三维激光扫描技术在沉陷监测中的应用问题探讨[J]. 煤炭科学技术, 2008, 36(11): 91-95.